An oil painting of Russian warriors on the shore. The Mongols conquered the region north of the Black Sea in the 1230s. Kiev, capital of Ukraine, was conquered by Batu Khan in 1240. Slavs in the region, for a long time, stayed under the rule of the Golden Horde Khaganate, which was founded in the region in 1241. During this period in history Moscow was a small settlement. The city became an independent principality after Yury the Third, backed by the Golden Horde, took the title of Grand Prince of Moscow. With this support, Moscow became stronger compared to the principalities of Tver, Pskov and Novgorod. The princes of Moscow began following a policy of uniting all Russian territories under themselves. Under the reign of Ivan I, between the years of 1328-1340, the title of the Prince of Moscow became "Grand Prince of All Russia." Under the reign of Ivan III, between the years of 1462-1505, all Russian lands were united around Moscow. Kievan Slavs on the other hand founded the Principality of Galicia-Volhynia on the present day Polish-Ukrainian border following the Mongol invasions. But the lands of this principality were invaded on the north by Lithuania and on the south by Poland. In 1569, by the treaty of the Union of Lublin, the region came entirely under the control of Poland and Lithuania. Southern Ukraine was ruled by the Crimean Khanate, a successor of Golden Horde and became a vassal state of the Ottoman Empire in 1475. While Kiev and Ukraine were under the control of foreign powers, the Slavs in the north, centered around Moscow, were getting stronger. The Cossacks, one of the ancestors of Ukrainians, became a central matter in Ukrainian-Russian relations by the 17th century. The Cossacks were the primary political and military power in the steppes of Ukraine since the 16th century. They established a variety of alliances with Russia, Poland and the Ottoman Empire. With the treaty of Andrusovo between Russia and Poland in 1667, Cossacks living in Kiev and along the Dnieper River fell under the rule of Russia, while the rest fell under the rule of Poland. Despite being under occupation, the Cossacks continued to strive for independence. Cossack Hetman Mazepa sided with Charles XII of Sweden against Russian Tsar Peter I in 1709. But the defeat of the Swedish at the hands of Russians resulted in a heavy cost for the Cossacks. Tsar Peter I ended the de facto independence of the Cossacks in Ukraine. In the second half of the 18th century, Catherine II of Russia abolished the office of Cossack Hetman. A great portion of Ukrainian lands were then used for the relocation of populations living in conquered territories in Poland and the Baltics. Ukraine re-emerged following the collapse of Tsarist Russia. And in 1922 it officially became part of the USSR. Within this period, the Ukrainian identity of the republic was emphasized. As a reaction to Stalin's Russification policies, immediately following his death, Khrushchev transferred the Crimean peninsula to Ukraine. Ukraine became an independent state in 1991 following the dissolution of the USSR. Ukraine, the name of which is hypothesized to stem from "U" (at) + "Krai" (border) meaning "borderland" in Proto-Slavic, is one of the oldest settled regions in human history. 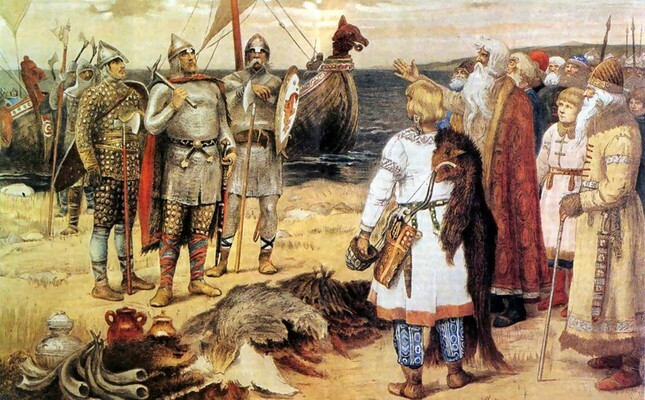 Slavs became more active in the region with the decrease of local Germanic populations in the 5th century, when Slavs began to found their own principalities. Christianity was introduced to the region by the conversion of Olga of Kiev, wife of the Kievan Prince Igor, in the 9th century. Olga is venerated as a saint by the Kievan church. After Kievan Prince Vladimir the Great converted to Christianity to marry the Byzantine Princess Anna in 988, the religion spread even more among Slavs. In Kiev, churches were made in honor of Saint Basil while pagan temples were destroyed. Vladimir, via agreement with the Ecumenical Patriarchate of Constantinople, founded the Metropolitan of Kiev and All Rus in Kiev. The Patriarchate of Constantinople had the right to appoint the metropolitan who governed the newfound metropolis. But after some time the church was moved to Moscow from Kiev. After the last Russian Patriarch. who carried the title of the metropolitan of Kiev, Metropolitan Jonas, moved the church permanently to Moscow, the city became the center of the Russian Orthodox Church. In 1448, the Russian metropolitanate made the decision to operate independently of Istanbul. The "see" (office) of the Metropolitan of Kiev and All Rus was transferred to the Moscow Patriarchate in 1886. In the past few months the Ukrainian Orthodox Church has begun cooperating with the Fener Patriarchate to become independent of the Moscow Patriarchate.